Dr Rebecca Carey from the University of Tasmania has invited us to join a team to explore a remarkable underwater volcano from the 27th March to 17th April. Through daily reports and photos, and by connecting with the scientists on board the research ship you can become part of scientific history in the making. Havre submarine volcano is located within a chain of submarine volcanoes that extends to the northeast of New Zealand (fig.1). This volcanic chain is called the Kermadec Volcanic Arc. The August 2012 eruption of Havre volcano was the largest submarine explosive eruption ever recorded. This eruption took place from depths of at least 900 meters below sea level and still was powerful enough to produce a plume of hot gas and steam that punctured the ocean’s surface and went into the atmosphere (fig. 2). Similar sized eruptions on terrestrial Earth are 1 per 100 year events. There are lots of scientific questions about submarine eruptions that remain unanswered. This is because the submarine parts of Earth are so difficult to explore! Scientists need expensive highly-engineered robots and submarines to explore in these regions, which is a lot more difficult than geologists walking up to volcanoes on terrestrial Earth and doing research. The research voyage to Havre submarine volcano in 2015 will use two underwater robots to sample rocks and pumice from the seafloor, and to observe the new volcanic rock formations. These new features are outlined on (fig 3). 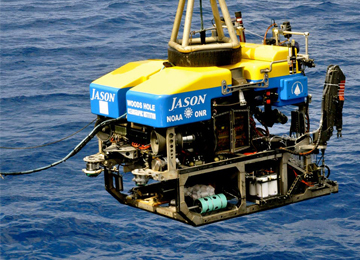 The Remotely Operated Vehicle (ROV) Jason (Fig. 4) will be connected to the ship with a fibre optic cable so that scientists and operators on the ship can drive it around on the seafloor, observe the new volcanic features and sample rocks and magma fragments called pumice. 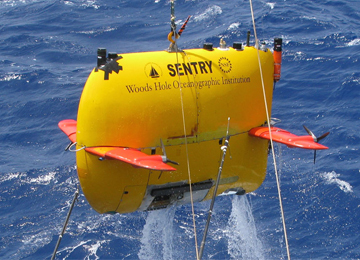 The AUV Sentry (fig. 5) will be programmed on the ship to investigate regions of the volcano, placed in the ocean and will zoom around the seafloor taking photos, collecting information about the depth of new volcanic deposits and also measuring the chemistry of water. Question 1. How does the overlying weight of water on the volcano influence the explosivity of the eruption? Volcanic eruptions are driven by the ascent of bubbly magma. Bubbles form within magma in the deep Earth, and are buoyant, wanting to rise through the magma and up to the volcanic vent to degas. If the magma is sticky enough, the bubbles are coupled to the magma and bubbles+magma rise to the surface to erupt as bubbly lava or as bubbly magma fragments called pumice. The magma rise rate from the deep Earth to the volcanic vent is driven by the amount of magma buoyancy, which in turn is related to the degree to which the bubbles are coupled to the magma. If magma rises to the volcanic vent slowly, it will ooze out and form lava. If the magma rises rapidly to the volcanic event, powerful explosive eruptions will result. With increasing depth in the ocean, there is an increasing weight of the fluid exerting downward force due to gravity, this is called hydrostatic pressure. Increasing depth = increasing hydrostatic pressure. That’s why submarine vehicles need to be made of strong materials to resist hydrostatic pressure, otherwise they would implode! In submarine settings, bubbles form in the magma but the hydrostatic pressure reduces the expansion and buoyancy of the bubbles. With reduced expansion and buoyancy the magma is more likely to erupt as lava. The Havre 2012 explosive eruption took place at least 900 meters below sea level. Until this eruption, scientists had predicted that eruptions at these depths would likely result in lava eruptions rather than explosive eruptions. The Havre 2012 eruption challenges those predictions! We intend to look at the explosive products (pumice) and conduct analytical research to discover the reasons why explosive eruptions can take place at those great depths. Question 2: How does the magma explosively break up during submarine eruptions? 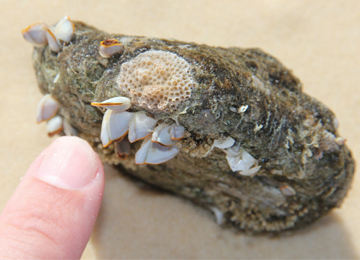 a) after the ejection of 1000’s of tonnes of pumice into the seawater column, there are less collisions of pumice in the seawater, which limits abrasion of the pumice and the formation of ash-sized particles. b) because the sizes of ash particles are small (<2 millimeters) they efficiently rise in the water column perhaps to the ocean’s surface, and in those regions they are strongly influenced by water and wind currents. The water and wind currents are very efficient at taking the particles far from the eruption site, which is why there is relatively little ash observed on the volcano summit or flanks. c) there is less ash generated during submarine explosive eruptions due to the mechanisms of magma fragmentation and disruption under high hydrostatic pressure. We will observe the volcanic deposits of Havre volcano on the seafloor (fig. 3) . With the ROV Jason we will sample the new deposits on the volcano’s summit and flanks. To establish the amount of ash in more distal regions – ie., 10s of kilometres from the volcano summit, we will conduct coring operations. An empty metal cylinder with a weight at the top is dropped off the ship. This cylinder impales the seafloor and the upper weight hits the top of the cylinder and pushes it into the seafloor sediments further. The cylinder (with the seafloor sediments inside) is then brought back to the ship. The core of seafloor sediments within the cylinder is removed on this ship and examined. This core of sediments will contain ashes from volcanic eruptions in the region. It is likely that the Havre ash will be the uppermost ash layer because the eruption was so recent in 2012. We will conduct multiple coring operations in the distal region of Havre (fig. 5) and in the laboratory we will measure the abundance of ash in the samples. All this information will help answer our research question. Question 3: When magma explosively fragments, how are the particles transported in the ocean? The map of the new 2012 eruption products on Havre volcano show multiple new features, large and small volcanic cones, ‘tongues’ of volcanic material gain extending from the New Cone, and a ‘bulge’ of material in the west of the volcanoes summit (fig 3). We will explore the particle transport processes responsible for their formation using the AUV Sentry and ROV Jason. The AUV Sentry has a sophisticated instrument on board which can map the thickness, and layers, of each cone or tongue. The ROV can then observed the features of these cones and tongues, and based upon our knowledge of terrestrial eruptions, we can predict the particle transport style.